The National Gallery of Canada reopened the Canada Pavilion this summer, one of only 30 permanent structures on the official Venice Biennale grounds. For years, Canadian artists chosen to represent their country at the Venice Biennale – the world’s most prestigious visual-arts festival – have described the experience as a great honour, tempered only by the building they had to work in. The National Gallery of Canada is hoping those days are behind it. This summer, the Ottawa institution reopened the historic Canada Pavilion, one of only 30 permanent structures on the official Biennale grounds, after a complete restoration. Although the Canadian building is more modest than its neighbours, its very location in the leafy Giardini (“Gardens”) is an honour – dozens of other countries are forced to exhibit elsewhere. Some aspects of the building had to stay the same, such as its relatively small size and unusual shape. But in addition to fixing up the creaky structure and leaky windows, the restoration also provided things artists had been asking for – including better lighting – and things visitors had been asking for, such as a new exterior deck with seats overlooking a lagoon. Italian architect Alberico Belgiojoso, who led the redesign, said he wanted to keep to the spirit of the original vision, a spiralling building shaped like a nautilus shell with huge windows and, unusually, two trees growing through it. The Pavilion was first unveiled in 1958, paid for by Italian war reparation funds and designed by a team of architects that included Mr. Belgiojoso’s father. 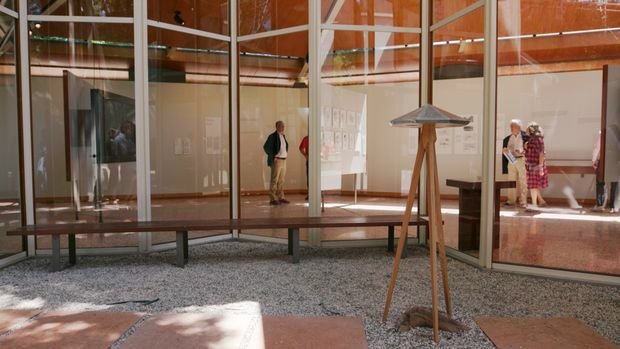 Venice’s prestigious Biennale alternately celebrates art and architecture each year. It is often described as the Olympics of the art world because it draws top competitors from around the world. The National Gallery leads Canada’s visual-arts representation in odd years, while the Canada Council for the Arts is responsible for the architecture exhibitions in even years. Because of the reconstruction, the Pavilion was not ready in time to exhibit this year’s official representation. 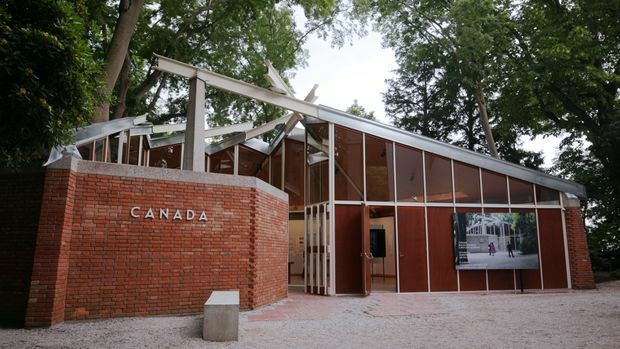 Instead, the Canada Pavilion is housing a display on the six-decade history of the building, and Unceded: Voices of the Land, by renowned Canadian architect Douglas Cardinal, is being shown at the Arsenale di Venezia, one of the main venues of the festival. In addition to fixing up the creaky structure and leaky windows, the restoration also provided things artists had been asking for, including better lighting. For sheer numbers, the exhibitions at the Canada Pavilion are some of the most popular programs that the National Gallery produces. Attendance numbers for this year’s festival won’t be available until after it closes in November, the National Gallery said. But last year’s event saw 400,524 people visit the Venice building – compared with 324,514 visitors who came to the gallery in Ottawa during the same time period, records show. Anne Eschapasse, deputy director of exhibitions and outreach at the National Gallery, said the Biennale is a perfect platform for Canadian artists to get global exposure. “It's really where you have the best chance to get noticed by the media and by the critics and collectors and galleries,” Eschapasse said. Past visual artists who have represented Canada at the Biennale include Emily Carr, Jean-Paul Riopelle and Alex Colville. Reesa Greenberg, an Ottawa-based art historian and philanthropist who funded the $3-million project, says she was motivated to give by the chance to make a strong gesture for international co-operation. “The fact that the restoration, which involves a 10-year back and forth between Canada and Italy, resulted in a solution that is livable for both parties, is very heartening in an era of increased nationalist populism and patriotism in other countries,” Greenberg said in a video posted online by the gallery. Karen Colby-Stothart, the chief executive officer of the National Gallery of Canada Foundation, says the Canada Pavilion has been the signature project for the gallery’s charitable arm over the past decade. The Foundation has seen a steady growth in big-ticket donations in the past five years. Two rooms in the Gallery were named after philanthropic families – the Sobeys and the Koerners – in 2015 when they each endowed $2-million to a fund for programming at the pavilion. The gallery also offers its donors who give more than $100,000 – a group it calls Distinguished Patrons – other opportunities, including international behind-the-scenes tours in artistic hotspots such as London or St. Petersburg. Editor’s note: Editor's note: (Sept. 13, 2018) This article has been amended to specify that $2-million endowments from the Sobeys and the Koerners went to a fund for programming at the pavilion.